Fangirls, a whole bunch of business just went down in this issue. 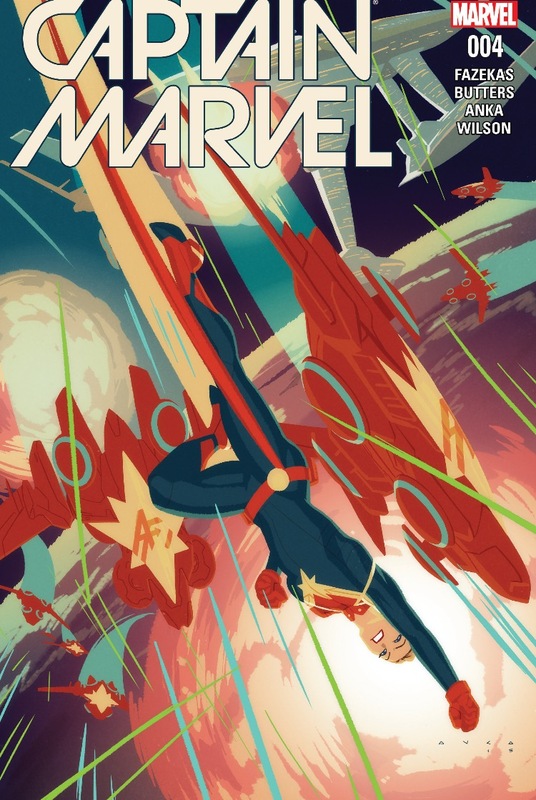 When we last left off, Captain Marvel’s powers were failing, they were being attacked by a virus-like ship, and it a new ship was broadcasting “Death to Hala” on repeat at them. 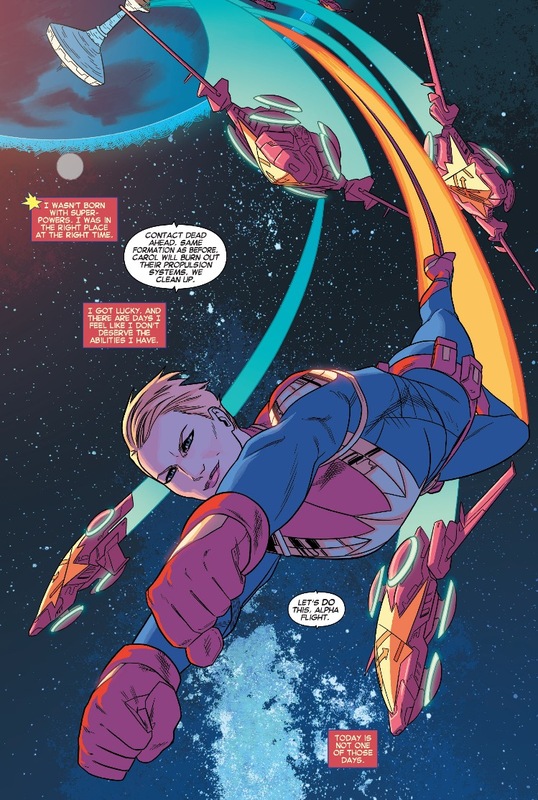 Seeing as Captain Marvel wears the Hala star on her uniform, and their whole dang ship is shaped like a Hala star, things were not looking good at all. One of the first things they do in this issue, is to evacuate the ship. They send everyone other than a skeleton crew home; as few casualties as possible is the goal. They also destroy the virus ship, returning some power to Captain Marvel. After that, she takes her Alpha Squadron out to go after the incoming ship. They soon learn that the ship’s shields are impregnable, and must retreat. 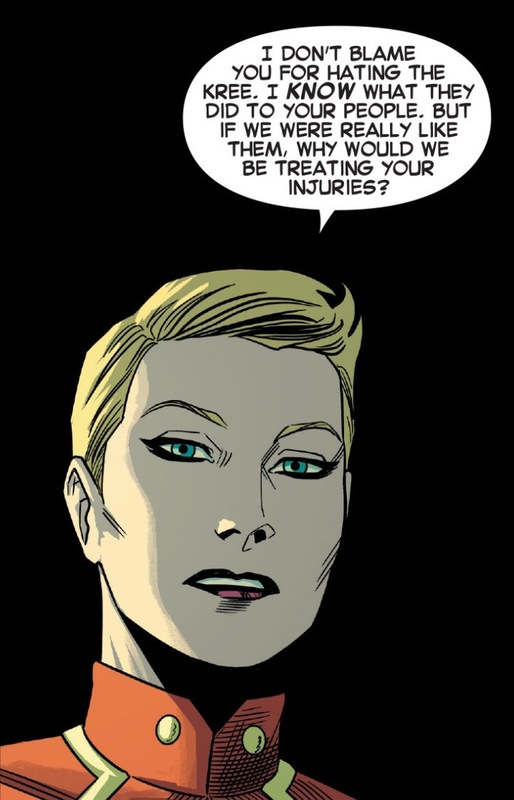 They take a pilot with them, and when he comes to, Carol explains to him that they aren’t going to hurt him; they’re actually going to fix him up and send him on his way. They’re hoping that this olive branch gesture will help them to gain some of the attackers’ faith and confidence, showing that they are not the Kree, and are not out jut to kill. But when they send the pilot back, he gets shot down by his own mother ship. 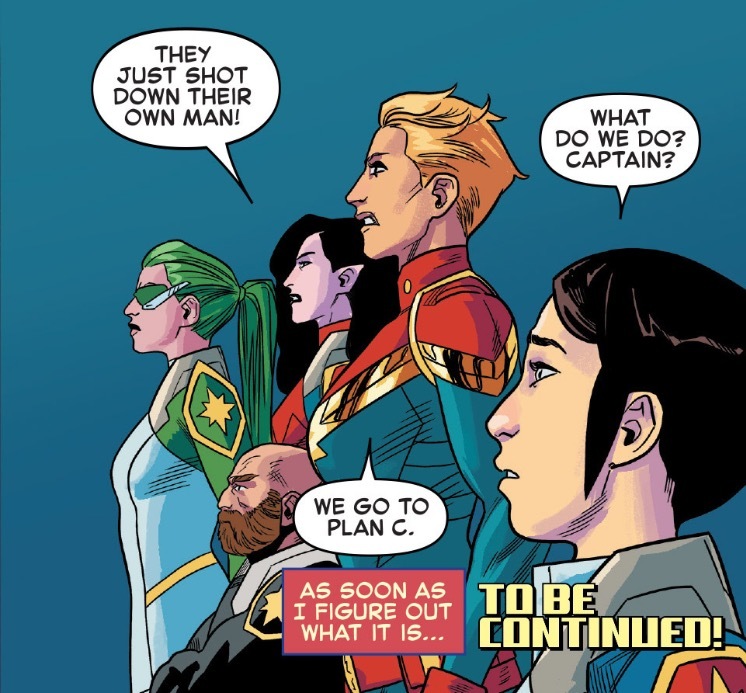 The issue ends there, with Captain Marvel trying to figure out another back up plan. I’m honestly quite worried about them; they’re being attacked by creatures who think they’re Kree externally, and by some mystery saboteur internally. A lot is happening, and I’m worried that it’s all going to hit the fan harder than usual far too soon.